Looking for a job in Gadsden County Florida? 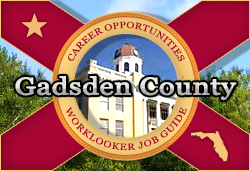 This Gadsden County Florida job guide is a resource for job seekers looking for legitimate employment opportunities in the region with an emphasis on government positions, top healthcare employers, public school careers, and major job boards. Gadsden County Florida can be a good resource for ongoing employment opportunities. Check their site for the latest listings. To apply for a position with the Gadsden County Sheriff's Office you can view jobs online at www.gadsdensheriff.org or contact Personnel at 850-875-8848 Monday-Friday, 8a-5p, to check on the current available positions. The City of Gretna periodically posts job openings. During review there had been an open position for a Reserve Police Officer. Check the City of Midway for current listings. City of Quincy maintains an employment page that may periodically post updates. Wal-Mart promotes more than 400 people every single day, and 40% of promotions go to first-year associates. Plus, complete their training program and you'll gain important skills and an opportunity to boost your paycheck. SUPERVALU had openings for Warehouse Workers on this review date. Other positions are advertised as vacancies become available. Capital Regional Medical Center provides emergency medical care to the citizens of Gadsden County and the surrounding area. Throughout the network positions were found such as Medical Technologist, Emergency Services Technician, Registered Nurse Charge RN Progressive Care Unit, Surgical Technician, Director of Cardiac Cath Lab, Monitor Technician PRN, Registered Nurse Cardiovascular, Emergency Room RN PRN, Registered Nurse RN Medical Telemetry, Registered Nurse RN Post Anesthesia Care PACU, RN PCU, Emergency Room RN, Registered Nurse RN CSICU PRN, Registered Nurse RN Labor & Delivery, Sonographer PRN Per Diem, Pharmacy Technician, Psychiatric Nurse, Monitor Technician, CT Technologist, Pharmacist PRN, Registered Respiratory Therapist PRN, CT Technologist, Nurse Manager, Registered Psych Nurse RN, Assistant Controller, Certified Nurse Assistant CNA, Clinical Pharmacist PRN , and Certified Nurse Assistant CNA PCU. Riverchase Health and Rehabilitation Center specializes in skilled nursing and rehabilitation services. NHC HomeCare recruits only the highest quality partners whose commitment to quality care and customer service meet the standards for our fine community. Gadsden County School District has an ongoing array of employment opportunities. Here you may find openings such as Science Teacher, Language Arts Teacher, ESE Resource Teacher, Reading Teacher, Gadsden Elementary Magnet School Teacher, 3rd Grade Teacher, Physicial Education Teacher, PE Teacher, Kindergarten Teacher, Math Teacher, Chemistry Teacher, Social Science Teacher, FTE Support Specialist, School Bus Driver, Custodian, School Custodial Jobs, School Secretarty, School Principal, Teaching Assistant, School Nurse, and more. This is a great jobs resource for the Quincy / Gadsden area. A survey of open positions found had included Warehouse Jobs, Quality Inspector, Registered Nurse RN, Licensed Practical Nurse LPN, Maintenance Clerk, Maintenance Worker, Dental Receptionist, Mechanic, Concrete Laborer and Finisher, Receptionist PRN, MA or LPN PRN, Biscuit Maker, Cashier, Restaurant Manager, Speech Therapy Job, Speech Language Pathologist SLP, PE Teacher, Pharmacy Technician, Delivery Driver, Physician, Business Education Teacher, Engineer, Plumber, Construction Engineers, Mental Health Assistant, Probation Officer, Electrician, Tax Professional, Physical Therapist, Office Manager, and Truck Driver. Make sure you expand all categories so that you can see all positions at-a-glance. Some positions are listed as "any location in Florida". This site has a job openings e-mail notification feature that's useful. CareerSource Capital Region offers numerous services to help you with your career, whether you are unemployed, underemployed or seeking training. Gadsden County Chamber of Commerce is a good resource for exploring economic climate and to find a listing of local businesses through their member directory. Gadsden County Development Council provides information regarding jobs & wages, labor force, housing, and more. This Worklooker directory includes The City of Tallahassee, Tallahassee Regional Airport, Capital Regional Medical Center, Tallahassee Memorial Healthcare, Leon County Public School Jobs, Florida State University (FSU), Florida A&M University (FAMU), Tallahassee Community College (TCC) Job Postings, and more. Now Hiring! Lakeview Center is Hiring Licensed Clinicians for our Milton, Pensacola and Crestview areas. - Apply Today! Lakeview Center Inc. currently has 4 openings. Must have a Valid Florida license as a LCSW, LMHC, or LMFT. 2 year(s) experience minimum working with children 0-5, children over 5, adolescents and/or adults who have mental health, substance abuse and/or co-occurring disorders or developmental disabilities. To Apply: Interested applicants please visit www.elakeviewcenter.org and complete the on-line application. If you require additional assistance, please call Human Resources at 850-469-3729. Lakeview Center is an Equal Opportunity / Affirmative Action employer. Now Hiring! Senior Programmer/Analyst - At LCI we have an employee focused, diverse, and service oriented environment. We help people throughout life's journey. - Lakeview Center, Inc.
We have competitive compensation with opportunities for annual raises, and professional development. Benefits include 403B, tuition reimbursement/great insurance options. Under the direction of immediate supervisor and department director, provide application support to meet enterprise objectives. Role Requirements • Bachelor's degree in IT or related field of study and five (5) years experience in application system support or Associates degree and eight (8) years experience in application system support. Experience to include rapid delivery of quality service. Apply online at elakeviewcenter.org. Enter 8964 in the search field. This will take you directly to our online application. Now Hiring! Lakeview Center, Inc. is hiring. Become part of an organization that helps people throughout life's journey! - Ft. Walton, Crestview, and Defuniak, FL. We have Child Welfare Case Manager and Family Support Worker positions available in Ft. Walton, Crestview, and Defuniak, FL. Please go to our careers website at https://www.elakeviewcenter.org to apply. You can enter the job title or location to view our open positions. Now Hiring! Line Cook / Sous Chef - Apply Today! Now Hiring! Lakeview Center, Inc is hiring! Join us in our mission to help people throughout life's journey - Apply Today! Lakeview Center, Inc. is currently accepting applications for qualified individuals interested in the positions of Director of Nursing (DON), Registered Nurse (RN), Licensed Practical Nurse (LPN) and Behavior Technician II. There are currently full-time and part-time positions available at our Milton, FL facility. Hours include weekends and holidays. Salary depends on qualifications. You can submit your application to our careers page at elakeviewcenter.org. Simply enter the desired job title in the search field to apply. Visit Lakeview Center to apply. Now Hiring! Granny Nannies is looking for caregivers in Hillsborough, Pasco and Pinellas Counties - Apply Today!